I have an online shop where I sell some of the items I have designed and written about. I normally have the PCBS made in china and then populate them and test them myself at my local hackspace or when I'm in a rush on the kitchen worktop - Note to young engineers: a surer method of annoying your significant other I have yet to find! It is often quite stressful and difficult for me to hand solder surface mount components. I have to test and fault find the circuit and get everything working....after that shipping the orders in good time only compounds the issues. It's all about being prepared and patient...I am not always good at being prepared and then my patience wears thin! They sell all sorts of useful bits and pieces for the electronics hobbyist and also have a PCB manufacturing service and now more recently a PCB assembly service. I have had at least fifty PCBS made by Elecrow and the quality has always been excellent. The price has always been acceptable and the service excellent. I may have also quietly lost my temper with my ineptitude in assembling surface mount components on small printed circuit boards and decided to see how much it would actually cost to get the whole product made by Elecrow. Next I uploaded the gerber files for the project in a zip file along with the bill of materials with at least two sources for the components and the package sizes. Ensuring the design is correct and the bill of materials is correct is critical...I cannot stress this part enough! The initial price I paid to have the project assessed and the printed circuit boards and solder stencil made was £32.05 or $41.76 USD. This all started on a Sunday night on the 23rd of June. A very helpful lady named Shelley got in contact within a day to say the order had been received but production would not start as they couldn't open the bill of materials spreadsheet I had sent with the gerber files. I made the mistake of not uploading the bill of materials in the Microsoft Excel format, very quickly resolved by resending the BOM in the correct file format. Shelley got in contact within a few days to provide a quote for fitting the standard components or for fully populating the PCB. The full cost was another £61.41 or $80 USD for ten fully completed PCBS which I thought was quite reasonable so I sent the money over and hoped for the best. I also sent through some basic instructions and tips on how to populate the PCB gained from my own experience in doing it - I didn't want anyone else to struggle populating the PCBS like I had and I also wanted to be sure that when the boards arrived they worked first time! On the 12th of July Shelley emailed to say that the boards had been manufactured and that component population was about to start. She did say that they had issues with the Op-Amp I had chosen but this was sorted pretty quickly....luckily my circuit will work with just about any Op-Amp so I wasn't too worried. On the 18th of July I got an email from someone named Sunshine to say that the my order was complete and shipped by DHL. I didn't actually bother tracking it but it arrived today on the 24th of July, well packaged in a sturdy cardboard box and bubble wrap. 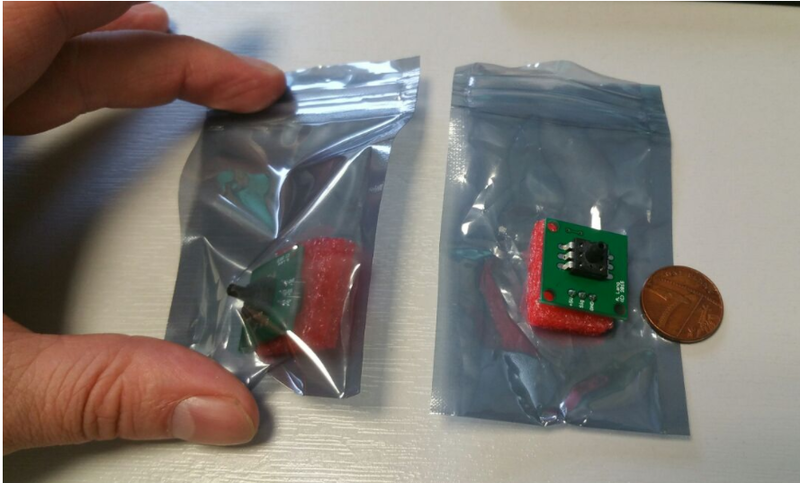 Each PCB was individually wrapped in a zip lock anti-static bag with some anti-static foam on the header pins. Every single one of the boards worked perfectly. Here are some photos of the PCB etc...I didn't take any of my smiling face!!! The coin is a one pence sterling coin for scale. 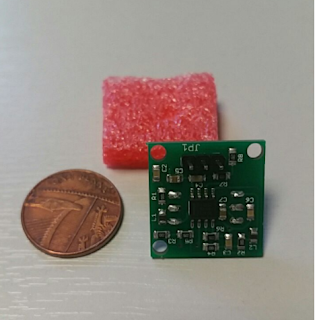 Populated Pressure Sensors From Elecrow! Check out the reflow soldering! For the price (£93.46 or $121.76) I am very happy with the service that Elecrow provided and I will be getting more of these boards and other boards fully populated when I need to. Shelley did say that If I get a higher quantity of PCBS made up the price quoted would reduce. I just hope I manage to sell them all so that I can get more things made...maybe I should spend more time advertising over designing and blogging?!?? I doubt that I will ever sell enough of these to retire but I do enjoy keeping my hand in the manufacturing process - it is very useful to know how to get things made and if I ever do come up with a cunning plan...I mean product I can realise it fairly quickly and efficiently with Elecrow's help.